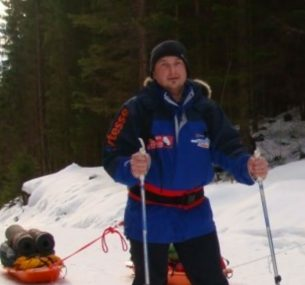 Dave Sissens chose to support Children with Cancer UK by doing something quite extraordinary. In April 2012 he crossed 150km of precarious sea ice in a Polar expedition. Pre-2008 my only sporting focus was in windsurfing, rugby and the occasional run. After suffering a Hemopneumothorax followed by six weeks of hospital treatment in 2009, my drive to ‘raise-the-bar’ developed. Soon after leaving hospital I competed in the New Forest Marathon and it was then that my thirst for physical achievements commenced. The following year I ran a marathon and a half, in just a day and a half. 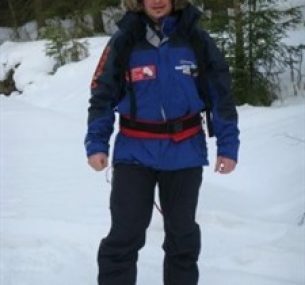 My first Polar Expedition is now beckoning and I am training to walk from 89° North to the North Pole itself. On 9 April 2012 I will make my way to Oslo in Norway. From there I will head north (yes it is possible to go further north still!!!) on a plane for three hours. This will take me to Longyearbyen in the Svalbard Archipelago. After staying there for a night I will hook up with the team and we will make last minute preparations over two days. We will wait for a break in the weather and then be flown to Barneo. Camp Barneo is an ice base, annually established on an ice floe relatively close to the North Pole. The first “Barneo” ice base was established in 2002. The ice base is sponsored by the Russian Geographic Society and normally lasts for the month of April. Our team of five will head due north over the precarious sea ice for the remaining 150km of the planet until we come across the North Pole! After a quick tour of the scientific research facility, we will be airlifted by helicopter to exactly 89° North. Then the fun starts, it’s here, the expedition will start. The ocean at this point is over 4km deep! Not being able to predict the movement of the ice floe, the journey should take between two and three weeks. I will be man-hauling my own sled, or pulk, the entire distance for over 12 hours per day in -40°C temperatures. I chose to support Children with Cancer UK because I have seen first-hand the phenomenal work this charity does at both an enterprise and family level. When running my first charity run, a young friend of the family was diagnosed with leukaemia, and seeing the charity in action really touched my heart. From that point on I have vowed to help raise money for Children with Cancer UK to continue its fantastic work. My aim is to raise £20,000 for Children with Cancer UK. So far, and thanks to the generosity of many, I have reached around £18,600 through fundraising events. One of these was as a Titanic themed cocktail event in March 2012. There were over 80 party-goers, all dressed to impress, in the recreated casino and Martini/cigar lounges. Organisers Mr and Mrs Viggers and Mr and Mrs Snelling, along with help from Bishops Stortford Rugby Club volunteers, left no stone unturned in making it a truly remarkable party. Thanks to the support from everyone who attended, and the companies who very kindly donated their goods and services, we raised over £3,000. Massive contributions from friends, colleagues and family have help generate a truly staggering amount of sponsorship. None on the expedition would be possible without the immense help from Vtesse Networks, Jacks of Dunmow, HPEMS of Dunmow and PCubed. After a year in the preparation I am truly ready for the challenge. The drive of knowing what Children with Cancer UK will gain from my efforts will get me to the Pole. I am a true believer that we should all, no matter how small, try and make the world we live in a better place. This determination will help me in the tough times when it is blowing a blizzard, is -40° and dropping, when my feet are badly blistered, when I am hurting, cramping and running low on energy. Dave and his team reached 90° North in the early hours of 18 April. It was a long, hard and difficult night. The ice in the area broke up badly, parts smouldered into slush and it was like a labyrinth. At one point they were afraid they would not get close to the exact point itself! But they did. And just before 6am they could let the cheers loose. Out came cigars, cognac etc and it was wild scenes. The suspense of the last 24 hours let rip and they were just ecstatic. Dave has so far raised over £22,000! We would like to thank Dave for all his efforts. Thanks also to everyone who has helped Dave so far through sponsorship and donations. Congratulations Dave!